Organovo's 3D printed tissue has been used to accelerate the pre-clinical drug testing and discovery process. Traditional testing and development uses animal or a small sample of human cells placed in a petri dish, can cost on average $1.2 billion and take a dozen years. The cost is high, in part, because 90% of drugs do not pass animal and human clinical trials, so researchers must go back to the proverbial drawing board again and again until they succeed. 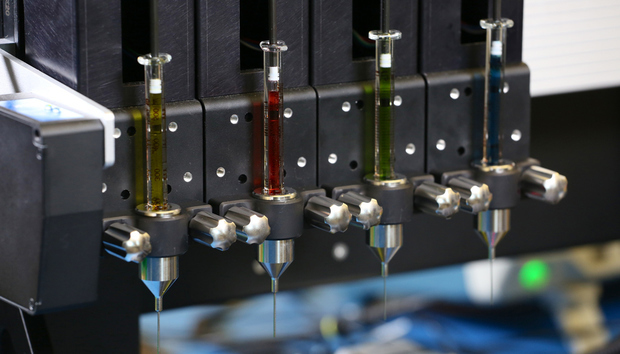 Organovo's bioprinting technology better models how human tissue reacts to drugs and helps identify toxic drugs before they enter clinical trials; the tissue is printed 20 layers thick and includes functioning blood vessels, which more accurately mimics real human tissue. "When you take liver cells and put them on a petri dish, those never have all the aspects of normal human liver biology because they're taken out of their normal context and put into that dish... and liver cells are much more unhappy than most cells in that environment," said Organovo CEO Keith Murphy. The major stumbling block in creating tissue continues to be manufacturing the vascular system needed to provide it with life-sustaining oxygen and nutrients. Living cells may literally die before the tissue gets off the printer table. 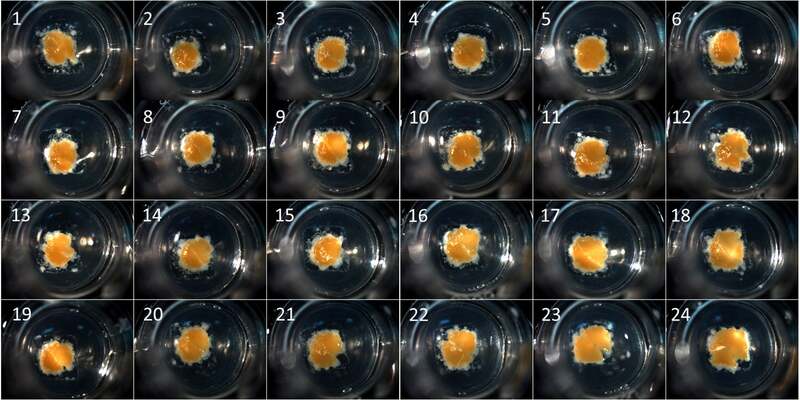 Organovo’s bioprinting process can be tailored to produce tissues in a variety of formats, including these micro-scale human liver tissues contained in standard multi-well tissue culture plates for drug testing. Organovo's ExVive 3D bioprinted human liver and kidney tissues are being touted as a breakthrough for drug safety and development. The bioprinting technology, which first saw commercial use in late 2014, creates the tissue and a network of capillary blood cells in the organ tissue in order to transport life-giving blood, better mimicking live organs. The vessels are made up of three different cell types stacked about 20 layers deep or about 500 microns thick. First comes a layer of human fibroblasts, then a 250-micron layer of human vascular smooth muscle cells and then a thin coating of human vascular endothelial cells. For some perspective on just how thin the printed vasculature is, consider that sheet of printer paper is 100 microns thick. So, the tissue Organovo has printed is the thickness of five sheets of paper stacked on top of each other. Organovo's 3D printed tissue is already being used by 11 of the world's top 25 pharmaceutical companies, such as Merck & Co., Bristol-Myers Squibb Co. and Japan-based Astellas Pharma Inc.. Both Merck and Astellas released data this month at the Society of Toxicology Conference showing that 3D-printed tissue is superior compared to traditional drug testing methods. The company's technology is now seeing uptake among small, venture capital-backed pharmaceutical companies, which typically work on only one or two drug development projects at a time. More recently, the technology has also shown the potential for "printing" larger therapeutic tissues used in transplant medicine. "We're now working toward clinical trials with liver patches for direct transfer to patients," Murphy said. "It's still early on this front; it's not a full organ, which we do think we can get to longer term. "What we said is how can we help the most people in the shortest time frame. Because we're able to make this liver tissue in a dish, we said let's make something using the same technology but make it as large as possible to put into patients." What Organovo has produced is a liver "patch" about the size and thickness of a dollar bill that can implanted in patients awaiting a liver transplant. "What it can do is essentially take these patients...and carry them for one or two years to give them better liver function and allow them a bridge to a transplant," Murphy said. "So it keeps them out of the hospital while they're waiting for a transplant. "We've got active animal trials going on and we're targeting having it in patients as soon as the year 2020," he added. In mice, the liver tissue patches have been shown to begin circulating blood as early as seven days after the transplant and for at least 28 days after implantation. The therapudic liver patch transplants will likely first be used in patients with acute, chronic liver failure and pediatric patients, where the need is most critical. Organovo intends to submit an "Investigational New Drug application to the U.S. Food and Drug Administration for its therapeutic liver tissue. The total market opportunity for the therapeutic liver transplants exceeds $3 billion in the U.S., according to Organology. Organovo is not the only research facility working on printing human tissue for implants and drug testing. Last year, the University of San Diego published a report showing it had succeeded in printing both liver tissue and a vascular system. The liver plays a critical role in how the body metabolizes drugs and produces key proteins -- that's why printed liver models are increasingly being developed in the lab as platforms for drug screening. MaRS Innovations collaborated with the University of Toronto to create the PrintAlive Bioprinter, which replicates skin cells by pushing the printed tissue through several channels to create a thin film of tissue. Other companies have succeeded in printing skin using a patient's own cells for grafting purposes. For example, MaRS Innovations created the PrintAlive Bioprinter in collaboration with the Innovations and Partnerships Office (IPO) of the University of Toronto to create a machine that prints skin that rolls off a mini conveyor belt. And the Wyss Institute for Biologically Inspired Engineering at Harvard University has created a 3D printer that can lay down four different types of cells at the same time. The breakthrough in that research has been the ability to create blood vessels that can feed living tissue.